Frequent readers have probably noticed a pattern among the entries of Unsettling Chapters. That is, the overt theme of a story is more often a sleight of hand. Put another way: The thing is not really about the thing. Lovecraft’s Old Ones are a manifestation of his insecurities. McEwan’s transgressions are a front for the anxiety of individuality in the face of rigid and arbitrary social mores. Murakami’s gore portrays mental disturbances rather than literal scenes. 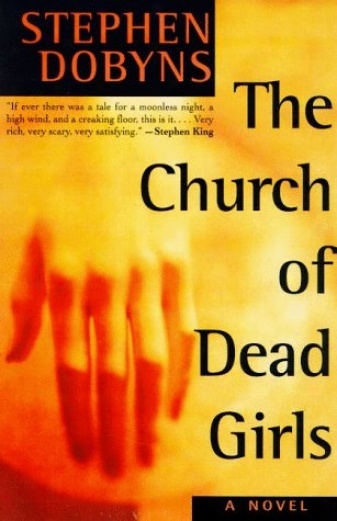 And so it goes with Stephen Dobyns’ 1997 mystery, The Church of Dead Girls. As with Birdman, Mo Hayder’s debut discussed on Oct. 5, the ghoul in this novel uses human corpses as an artistic medium. But while The Church of Dead Girls offers terror and thrills, it also has high-minded literary aspirations. The thing is not really about the thing. This is less a whodunit and more a sociological work. What are the fears and biases of small-town folk? What prejudices are lurking in the shadows? A rash of murders and missing teenagers brings them all to the surface. Things get ugly. “The Monsters Are Due on Maple Street” ugly. Once threatened, the townsfolk begin pointing fingers in every possible direction. This compelling arc makes for a fascinating read. And gruesomely detailed horrors make this a must-read for Halloween. Speaking of fingers, whatever happened to those missing left hands? Read the book and you’ll understand.